Camila Batmanghelidjh, the founder and president of Kids Company, has denied that the charity was badly managed and said it closed because of a lack of funding. Interviewed by John Humphrys on BBC Radio 4’s Today programme this morning, Batmanghelidjh said that Kids Company had not been run inefficiently. "If you look at objective facts, in the last 19 years we’ve passed every audit without trouble," she said. She said the charity had to report back on what it had done with the government funds it had received and she did not have in her possession "a single letter from central government saying we are not properly run in any way". Batmanghelidjh was asked by Humphrys about why the charity had no reserves and had had to shut so abruptly. "Every charity should have enough in reserve to pay its staff for three months – you didn’t. You were running a hand-to-mouth existence and that is not what charities should do," he said. She responded by saying she had been asking government for more money to address the situation. "What people don’t understand is that Kids Company has been carrying a statutory caseload of very disturbed children and young people who are self-referring off the street, for which we get no money." Humphrys suggested the organisation should have cut its coat according to its cloth. "That is exactly what we wanted to do," responded Batmanghelidjh. "We wanted the government to help take this caseload off us and make decisions about what we were going to do with them," she said. "I wanted government to come and take responsibility for child protection and child mental health cases that a charity like ours shouldn’t be holding." She said children and young people had been "pouring through our doors with very serious issues....I’ve been trying to get central government and civil servants to come down and look at the case load we have because it’s a moral problem." Humphrys pointed out that the charity had received £37m of government money, and that it was not the only children’s charity. "The fact is you had a great deal of money but in the end you were left without a penny," he said. Batmanghelidjh said the charity had insufficient money to help all the young people who had approached it for help. "It is not about bad management on our part, it's about trying to sort out something that society isn't dealing with," she said. She revealed that yesterday she had to persuade a young person who said he wanted to kill himself to move away from the platform edge at a train station, after he heard that Kids Company was to close. Humphrys played a clip of an unnamed young person who claimed the charity’s clients would get £30 from the charity, which some would spend on drugs. "It was weed heaven," the young person said. 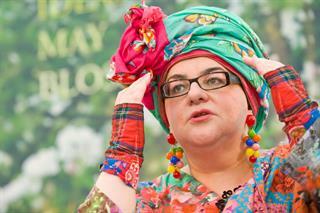 Batmanghelidjh responded that journalists had been paying the charity’s clients for material about Kids Company. Craig Dearden-Phillips: What went wrong at Kids Company?